Ospreys are Spectacular fish-eating birds of prey with a wingspan of nearly five feet. Find out more about Ospreys with our Osprey Fact File or check out the BBC’s Osprey web page. As osprey numbers rise we can expect to see an increase in the number of pairs in Cumbria, although this is a slow process as only about 3 in 10 naturally survive to adult hood. For the last 5 years YW, our 2008 male chick, has bred successfully at Fowlshaw Moss, with broods of healthy chicks. Another of our male chicks has been breeding in South Scotland for a number of years. 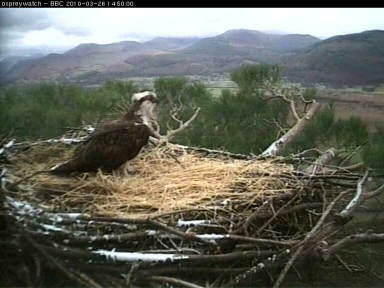 In 2010, one of the Bassenthwaite chicks from 2007 bred with another un-marked Osprey and laid eggs in South Cumbria but unfortunately none of the eggs hatched, not unusual for young inexperienced Osprey pairs. The pair were later seen on the coast nest building in late Summer, which is known as frustration behaviour, and often occurs after an unsuccessful breeding season. An Osprey believed to be another Bassenthwaite chick from 2007 was seen regularly around the Thirlmere area during 2010 but since then there have been no sightings. In 2001 a pair of ospreys nested beside Bassenthwaite Lake and became the first wild osprey to breed in the Lake District for over 150 years. The birds were encouraged to stay with the help of a purpose built nest provided by the Forestry Commission and the Lake District National Park. This was the culmination of several years of hard work. Ospreys had been summering in the Lake District since the mid 1990’s and in 2001 they started breeding, immediately adding sticks to the nest. Once the eggs were laid, wardens kept a round the clock watch to prevent disturbance and deter egg thieves. Ospreys usually lay three eggs, which take about six weeks to hatch. The young stay in the nest for seven or eight weeks. In late summer, the adult female will migrate south, leaving the male to feed the youngsters until they master the art of fishing. Bassenthwaite Lake is a National Nature Reserve, owned and managed by the Lake District National Park. Most of the surrounding woodland is managed by the Forestry Commission and provides valuable habitats for wildlife. Although in the UK the osprey population doubled during the 1990s, and has steadily increased since then, ospreys remain the fourth rarest bird of prey in the UK. Their eggs are still at risk of being stolen by collectors and they are easily disturbed by human presence. If water quality deteriorates, a reduction in fish could have a dramatic effect on the number of young birds raised. Finally, as ospreys migrate, they are vulnerable to habitat changes across southern Europe and Africa, and risk being shot by hunters. Anorak, windcheater, parka, duffle, – we have seen every sort of jacket to keep out the wind on Dodd this last week, and have found ourselves having sad anorak conversations on which brands are most effective. However, as is usual with man made inventions, nature has already done it better. 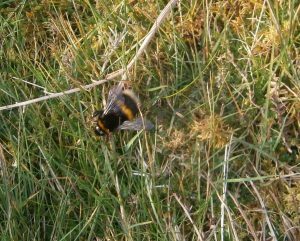 Bumble bees have their own unique brand of covering, in their thick furry coats, which enable them to be one of the first insects to come out of hibernation in Spring and survive the vagaries of changeable weather. The bee above was making its way back to a cosy mouse-hole in the bank late last Monday evening.